Richard Wormser (1908-1977) was a Princeton man and a pulp author who wrote 17 of the original Nick Carter books for Street & Smith (long before the Killmaster era) as well as several popular Westerns under the pseudonym of Ed Friend. He also wrote two paperback originals starring Southern California police Lieutenant Andy Bastion: “Drive East on 66” (1961) and “A Nice Girl Like You” (1963). The premise of “Drive East on 66” is awesome. A California real estate tycoon hires Andy away from his police duties for a two weeks side job. The assignment is for Andy to drive Ralph, the businessman’s troubled 16 year-old son, to an insane asylum in Kansas. The family also hires an attractive psychology grad student named Olga as the teen’s caregiver during the trip. Along the way, Andy notices that their car is being followed by a mysterious maroon Buick. Is the tail planning a robbery? Was it sent by dad to keep an eye on them? Or is the pursuer determined to make sure they don’t make it to Kansas alive? Andy, Ralph, and Olga are three vividly-drawn characters for the reader to join on this thousand-mile road trip. Although Ralph’s mental illness isn’t specifically defined, it feels like he’s an autistic savant of sorts - highly intelligent but prone to unexpected outbursts. Olga is a beauty trying hard to be professional during this unusual assignment, and Andy the cop is a top-notch pro with a good sense of humor. The competent officer provides the likable narration for the 150-page pursuit mystery. The book opens great and ends with some satisfying plot twists. There’s a bit of filler in the middle, but nothing too cumbersome. 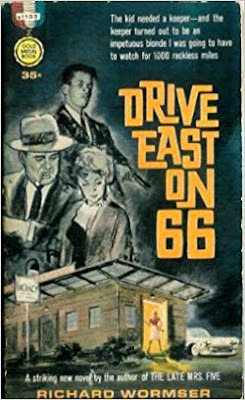 Overall, “Drive East on 66” was a good natured coming of age mystery that lacked any real edge or violence, but it was enjoyable enough if you’re not looking for a hardboiled bloodbath. Recommended.